Friday, October 08, 2010: Bill was up early and out patrolling the beach. It was a brisk and sunny day with unlimited visibility. I could even “see Alaska from my”…..well actually it was Nova Scotia across the bay but pretty impressive none the less. Especially being illuminated by the rising sun as it was. I brought my kite along and was able to get in some flying time. However with the sun rising in the east and the winds from the west the “wind envelope” was such that I had to squint into the sun. After a few minutes I had all these dark blue lines in my vision due to tracking the kite as it arced in front of the sun. It was pretty disorienting so I had to land and pack the kite away. I bet Timothy Leary would have enjoyed the visual effect however. The beach is made up of different sizes of material depending where in the tidal zone you happen to be. Toward the water it is all fine sand followed by coarse sand, pebbles, stones and then rocks. Walking along the strip made of pebbles caused each foot step to emit a squeaking sound, similar to the sound of walking on new fallen dry snow. If I was wearing corduroy trousers I could have performed as a one man band. The ill fated Scallop Dragger was visible due to the extreme low tide so I meandered down the beach to get a photo. By the time I arrived at the location it was gone! No, actually I guess I timed the tide right as I was able to take a photo of it. Another couple of hours and the poor vessel will be under 30 feet of water however. The photo is a grainy due to the distance and the limitations of my snapshot quality camera. At 1100 we broke camp and headed east. On the way out of town we stopped at the village harbor so I could snap some photos in better sunlight. As I was doing the shutterbug thing, Kit walked the area and met a Philadelphia expatriate by the name of Jim. He retired early from Sun Oil to pursue his passion for art in Saint Martin. He and his partner Kathi are incredible artists and also run a unique Bed and Breakfast in the village that features miniature horses. 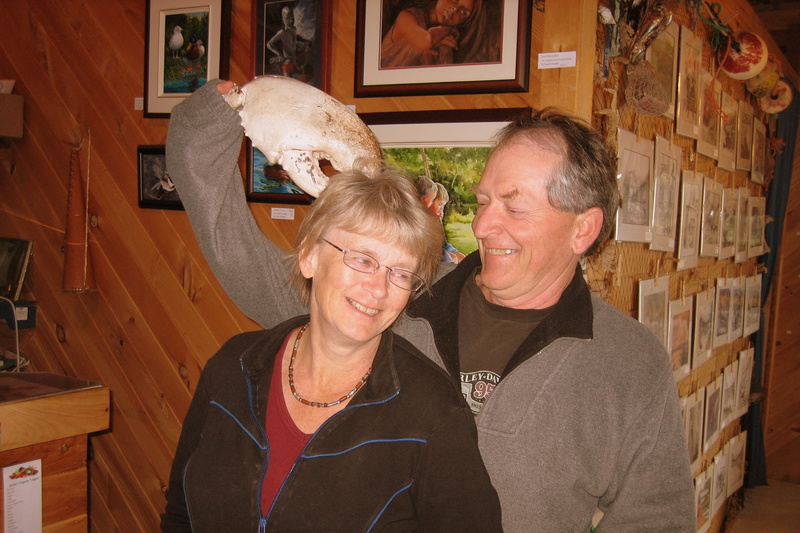 Below is a photo of the two of them in their retail shop. As you can see he has a sense of humor and a zest for life. We had a great time getting to know them and sharing stories. 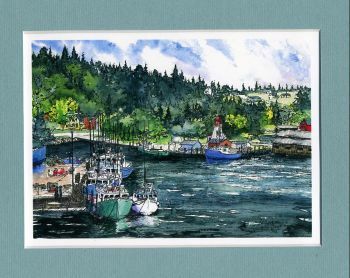 Check out their work at www.fundywatercolors.com and if you’re in the area their B&B looks interesting at www.stayatminihorsefarm.com . After selecting a couple of prints to purchase we took to the road on NB-111 toward Sussex. 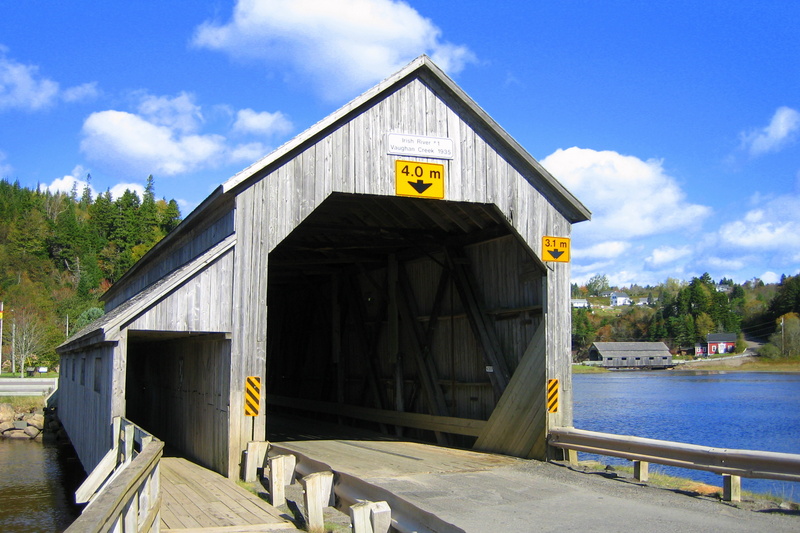 Leaving the village we came to this picturesque covered bridge which crosses the Salmon River. It was a pretty drive along the coast passing through some quaint villages. We turned the radio to a French folk station and enjoyed the music…..and even some of the lyrics. 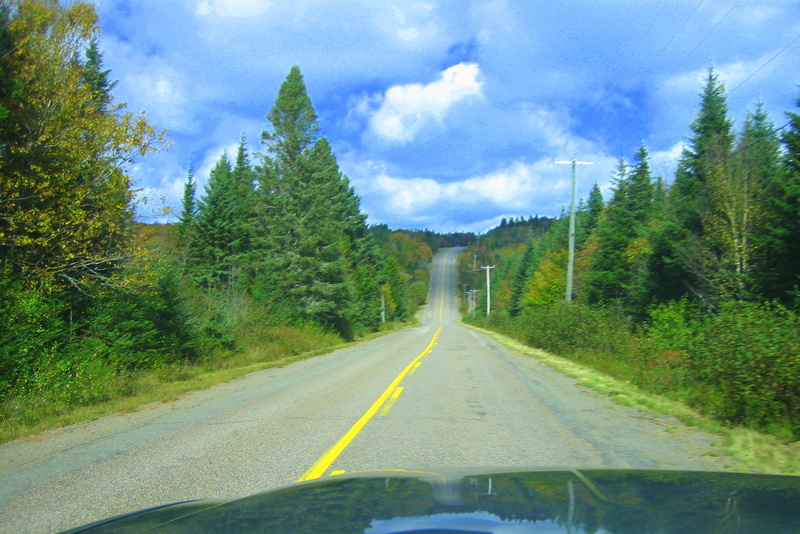 As in most every other place we have traveled there are even “pointy roads” in New Brunswick as well. 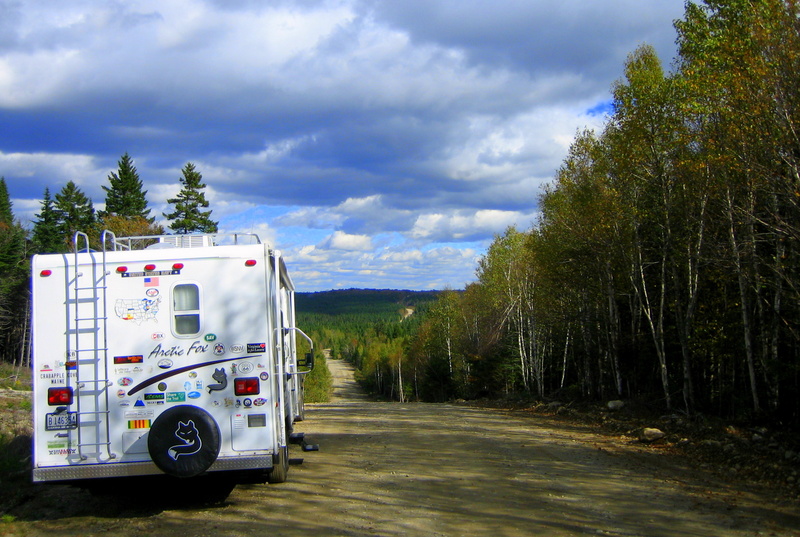 Keeping to our philosophy of traveling the back roads we dropped down to NB-31 toward Alma and Fundy National Park. The pavement soon turned to dirt then the dirt turned to ruts and the road narrowed to one lane for many miles. We crept along at about 7 miles an hour and hoped our decision to purchase a heavy duty truck and trailer was going to pay dividends and get us through. There were a few shallow water crossings so the truck and trailer got a nice coat of mud. In addition the trailer received some battle scars from the limbs intruding into the roadway. Well after our “shortcut” that probably took an additional two hours over the highway route we arrived at the intersection of NB-114 which we followed into the Park. The park was nice but a little too developed for our liking. There was a golf course, swimming pool, a hotel, and many full hook-up RV sites in three separate campgrounds. In addition to paying an entrance fee the camp sites were a bit pricy. We decided to stay anyway so we could more fully explore the park and surrounding area. 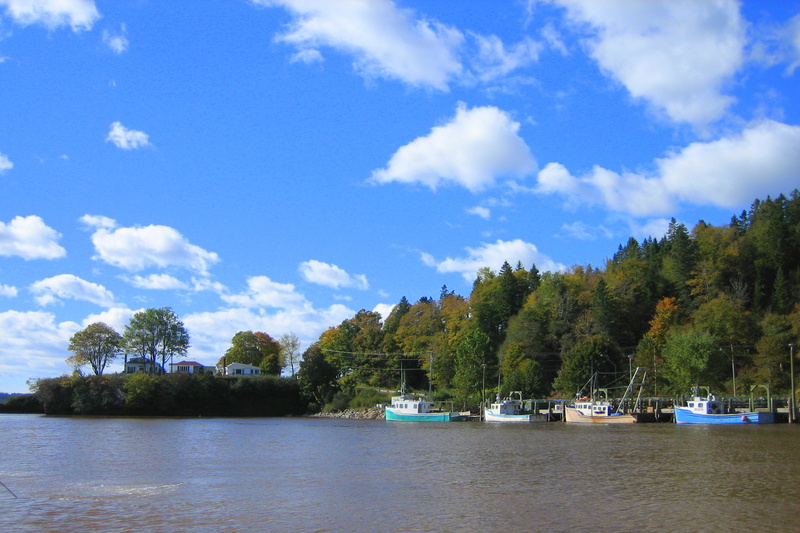 I took a walk into the town of Alma to stretch my legs and to snap a few photos of the harbor at low tide. On the way back a brief shower developed and just as quick it cleared again leaving a nice rainbow. 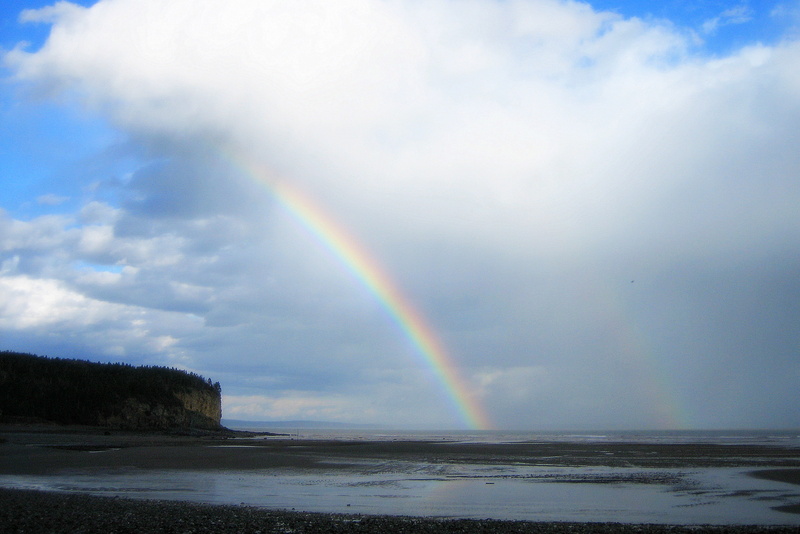 Actually it was a double rainbow but the second one is faint and hard to see in the below photo. 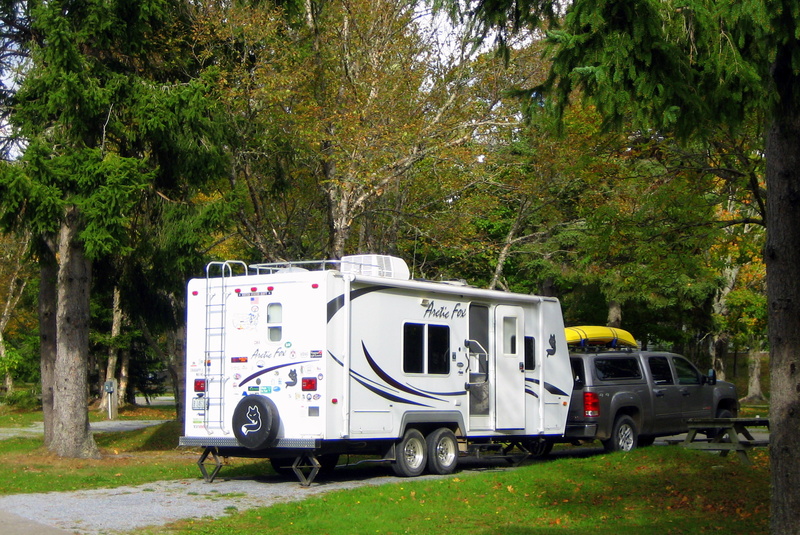 Saturday, October 09, 2010: Woke at 0600 to an outside temperature of 38 degrees and 53 degrees in the trailer…..turned on the furnace and in no time we were warm and cozy. There seems to be a lot of activity in the National Park for this time of year as one of the campgrounds was nearly full. Then we discovered it is Canadian Thanksgiving weekend. Of course back home this weekend is the Columbus Day holiday. Not sure how that all computes? Bill bellied up to the bar and made breakfast while Kit was entertained by daughter Suzie’s daily Facebook posts. As a special treat we had some of Bev’s homemade jam that we brought along. Thanks, Bev (and Jeff who I think actually made the delicious jam-Kit). After our morning routine (which is everything but routine!) we decided to unhitch the trailer and explore some of the National Park and surrounding area. First we drove out to Point Wolfe for a look around. Then over to Herring Cove for a walk around. Leaving the park we drove up NB 915 to Cape Enrage where the Canadian Coast Guard keeps a lighthouse. Returning to Alma mid afternoon we stopped at a local favorite called The Harbor View Café and had an incredible fresh seafood dinner. Needing to walk off the gluttony, Kit went to browse the shops and Bill returned to the waterfront to photograph the same view from yesterday only at high tide. The tide in this portion of the bay averages 40 feet and is kind of startling to see. 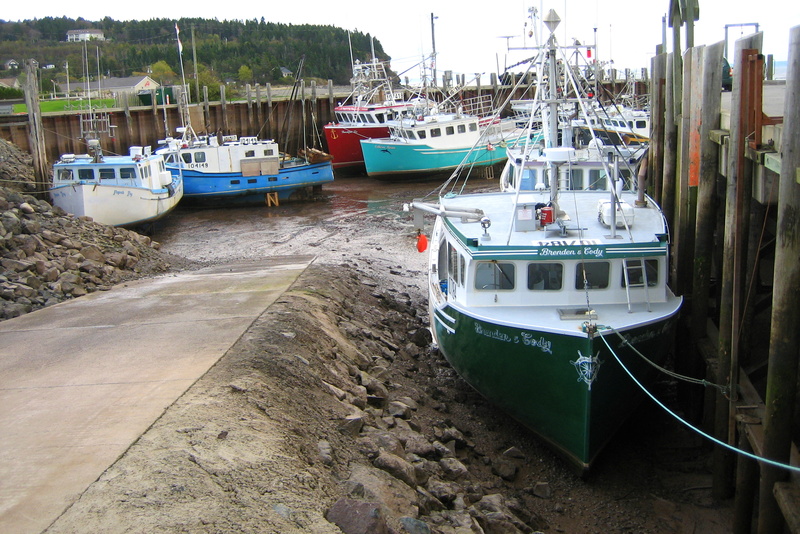 The maximum tidal range ever recorded in the Bay of Fundy was seventy feet! So what causes this extreme tidal range? 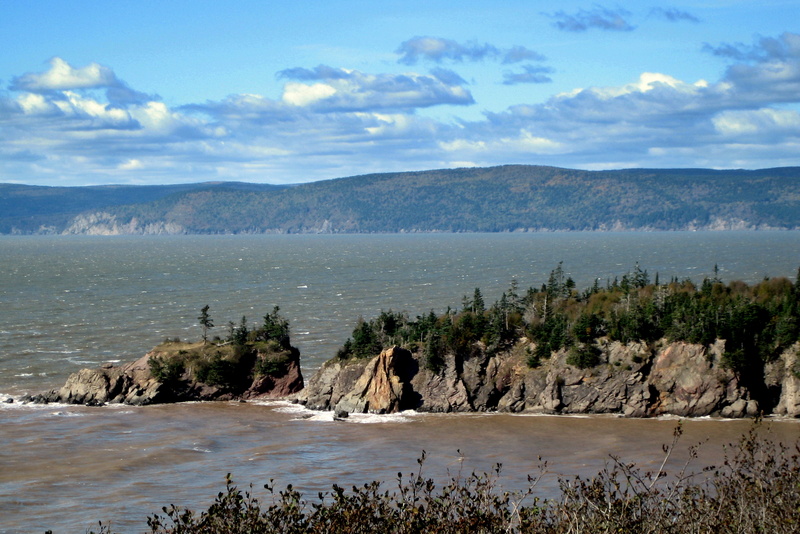 Well it all has to do with the fact that the Bay of Fundy is shallow and funnel shaped so natural influences are magnified. It is important to know that all vessels create “displacement” which is the volume of water displaced by the mass of the vessel. When the fishing boats are in port the combined displacement causes the water level to rise. Kind of like when Jeannie drops too many ice cubes into her Appletini glass and it overflows the rim. Then when the boats put to sea for the day the water naturally drops. So, what about the boats that are sitting in the mud, you ask? Well…..they belong to the captains that overslept. You can thank me later for the above bit of wisdom. I did notice that all the boats had very large rub-rails and as they bobbed in the water against the mooring pilings there was this squeaking sound from each that was at different pitches and intensities. It was kind of eerie to stand on the pier surrounded by all these boats and listen to the sounds. 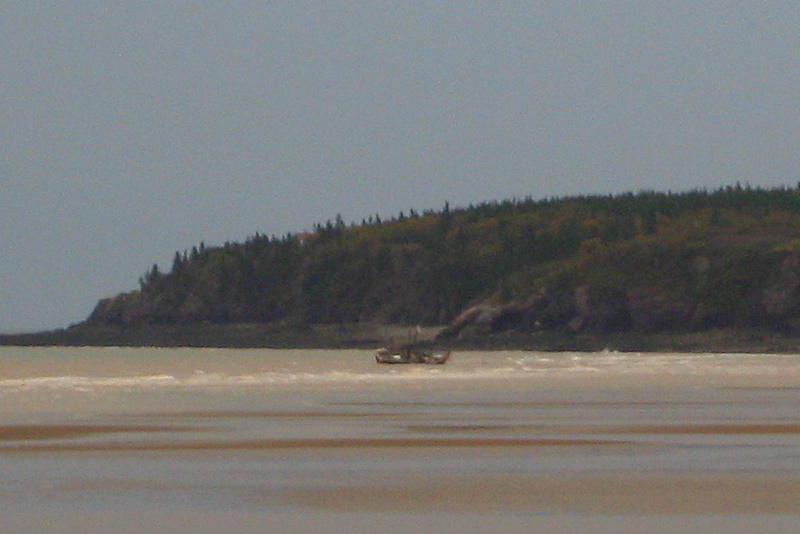 In addition if you look closely at the boats at low tide you will notice cradles made of wood or aluminum that the boats rest upon. It appears that the boats rise and fall with the tide throughout the day with no crew monitoring or handling of lines. Pretty amazing how these folks have adapted to an extreme natural phenomenon. At the waterfront park there was a memorial to Alma’s favorite daughter, Molly Kool. Now with a name like that you just know that she was destined for greatness. In 1939 Molly was the second women in the world to be licensed as a ship captain. She went on to command her 70 foot engine and sail powered scow for many years. Molly passed away last year at the age of 93 at her retirement home in Bangor, Maine. Kit’s Corner: My favorite place so far has been St. Martins. 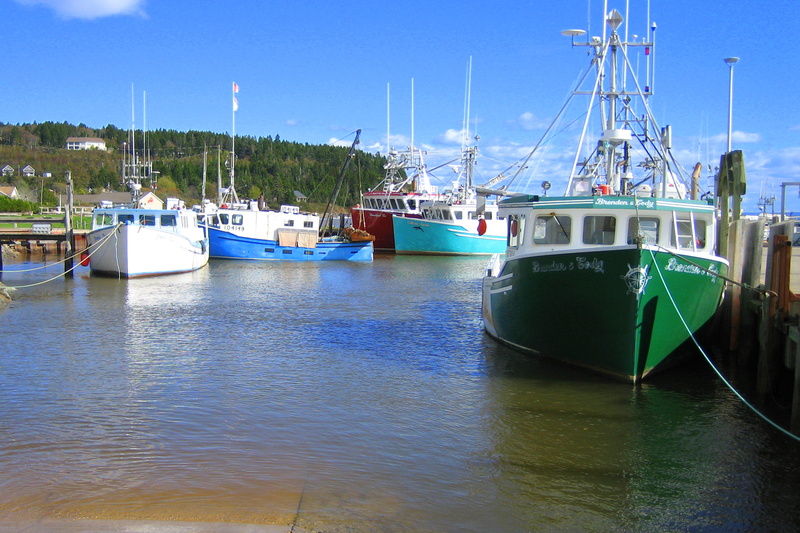 The Bay of Fundy and the town of Alma is quite nice, also. Just to set the record straight, we did NOT eat all that food at one sitting. We brought half of it back to camp and ate it later that evening. 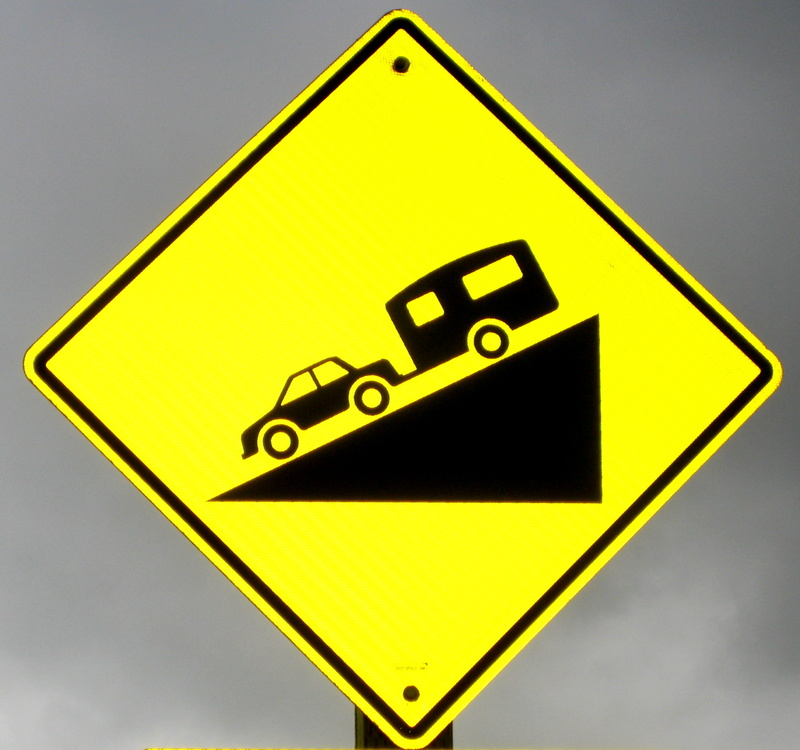 Oh, and some of these dirt roads we’ve happened upon, well, the latches on the cabinets in the trailer are beginning to loosen up….along with the rocks in a certain someone’s head….. Need I say more? Hi guys! Enjoying your journals. Sounds like a great time. Take care. Keep it up guys. 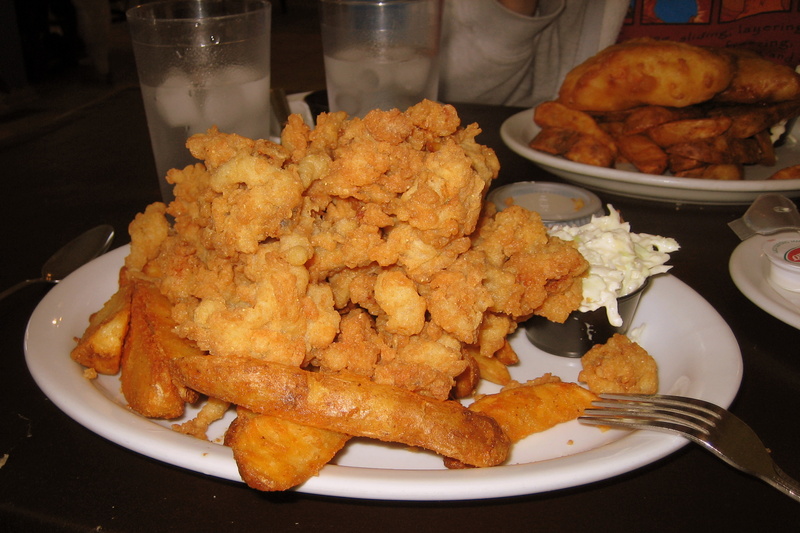 Loved the food shot, the tide shots, and the “sit’N’stare” comments. Rocks in your head or not Bill, would have loved the narrow back road. Kathy – what does your license plate stand for? Love the pictures of the tidal difference…reminds me of the Cook Inlet in Alaska. At times, the tide begins coming/going at the same time which causes a white water rapid effect. Very cool to see! Amen to Dave’s comments! 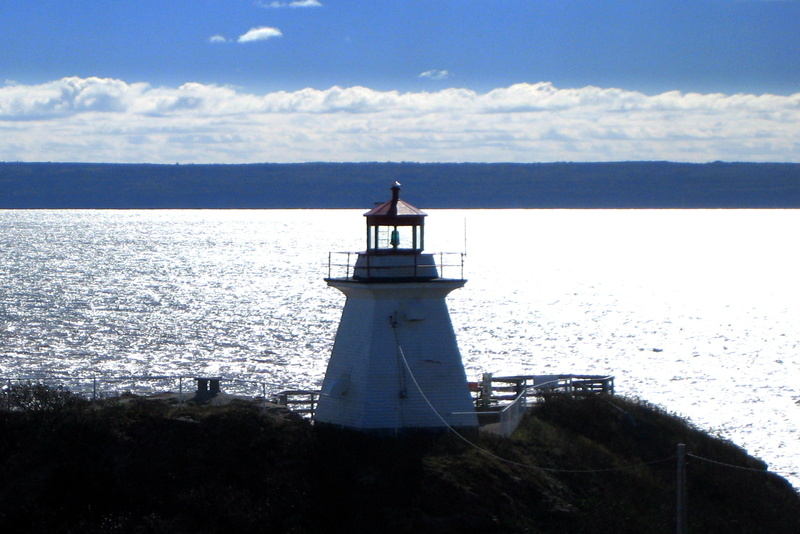 Also, we went to Cape Enrage Lighthouse a dozen or so years ago. Enjoyed it much and were as intrigued by it’s name as the light itself. Very pretty around there. We’re loving your journey. Anxious ti see your prints and will check out the websites. That is beautiful country up that way. By the looks of the land, sky and water it seems they have been able to stay away from the polution that has ruined so many places in the USA. That was tons of food for one sitting. If everyone would serve that much you could get a doggy bag and wouldn’t have to cook all week. Have fun!!! Hi Bill and Kit, I really injoyed the tour. Great pictures. Have a great time and keep the updates coming!!! !